Practicing nurse and New York Times columnist Theresa Brown invites us to experience not just a day in the life of a nurse but all the life that happens in just one day on a busy teaching hospital’s cancer ward. In the span of twelve hours, lives can be lost, life-altering treatment decisions made, and dreams fulfilled or irrevocably stolen. 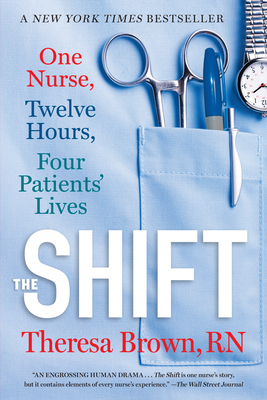 Unfolding in real time--under the watchful eyes of this dedicated professional and insightful chronicler of events--The Shift gives an unprecedented view into the individual struggles as well as the larger truths about medicine in this country. By shift’s end, we have witnessed something profound about hope and humanity.